Tag line: "The Blood Runs In Rivers... And The Drill Keeps Tearing Through Flesh And Bone"
Don't let the title fool you: The Driller Killer may sound like it's gonna be a blood-stained horror movie, and, to be sure, there are moments when it is just that, but it's also much more besides. 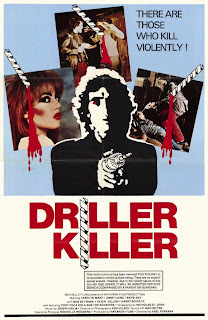 The first feature directed by Abel Ferrara, The Driller Killer is as much an art-house film as it is a violent exploitation extravaganza, and while it's not exactly a perfect marriage of the two, I wouldn't go so far as to call it a failure, either. Along with his work behind the camera, Ferrara stars as Reno, an artist who shares an apartment on New York's lower east side with two gorgeous roommates: Carol (Carolyn Marz) and Pamela (Baybi Day). Seeing as none of the three have steady jobs, the monthly bills are always a struggle, and their landlord (Alan Wynroth) is threatening to throw them out on the street. To make matters worse, the punk rock band that just moved into the apartment upstairs practices late into the night, disrupting Reno as he works to put the finishing touches on his latest masterpiece. Pushed to the breaking point, Reno snaps, and goes on a murderous rampage, thinning out the neighborhood's homeless population with the help of an electric drill. But as the pressures continue to mount, he soon turns his attention, and his drill, away from the homeless, and towards those closest to him. As with many of Ferrara's later films (he would go on to direct King of New York in 1990 and Bad Lieutenant in 1992), The Driller Killer is an odd mixture of indie experimental and exploitation. For the first half of the movie, we become intimately familiar with Reno and his two roommates, listening in as they argue over the phone bill, and watching as they try to convince their landlord to give them a little more time to pay. It's in these early scenes that Reno shows the first signs of buckling under; he has visions of himself drenched in blood, and hears strange voices calling his name. Throughout the bulk of its running time, The Driller Killer is very much a psychological thriller, interspersed with the drama of young adults struggling to survive in the big city. Once Reno crosses that line into insanity, however, The Driller Killer adopts a much sleazier tone, with Reno going on his killing spree, polishing off street people one by one (and to kick the exploitation vibe up a notch, there's even a lesbian shower scene thrown into the mix). Ultimately, The Driller Killer falls a bit short as both psychological horror (because Reno's fracture with reality isn't explored as fully as it should have been) and a slasher (there simply aren't enough kills). Yet with its unique perspective of New York in the late '70s, showing the city in all its graffiti-ridden, grimy glory, and sporting a handful of truly inspired moments, The Driller Killer reveals the promise of a talented filmmaker at the start of his career. Hi Mr. Shock I remember this movie. I was in my teen years when it came out and it was frigtening at the time, now it is almost laughable at the poor quality. A question for you; Now that you re in the jungle and it is unbeliebably good; Can it go weekly; Please Mr. Shock weekly would be buetiful. 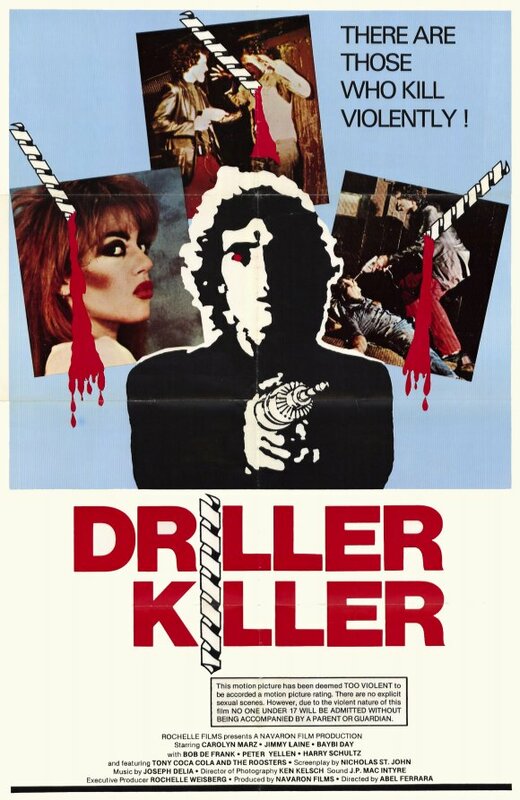 I actually hadn't seen THE DRILLER KILLER until recently, though I do wish I had a chance to do so when it was new. I'm guessing it would have had an even stronger impact then. As for Horror Jungle, thanks so much for the compliment. As for weekly, we have gotten requests for this, and while we can't rule anything out, I will say there are no immediate plans at this point to move to a weekly show. But who knows what the future will hold? Thanks for the comment, and for listening to Horror Jungle. It's a film thats title on its own is infamous but some how manages to fail to live up to expectations. Great work once again Dave! @Cal: Thanks for stopping by again. Yeah, the film is a bit of a let-down, but I did enjoy the New York setting, and there were moments that stood out. But still, not much to write home about. Double "AA" gonna give ya 2 A's on the new podcast. Excellent stuff. A bit surprised at 2 recks at first go around. Most hosts went big for # 1 with a high rated choice of thers cept Hellhunter a 7 and Bossbutcher a 6.5. Such a huge launch u would think they go big like others. Glad you enjoyed the show, and the double "A"s are much appreciated! Thanks so much for listening, and stay tuned! We recorded episode #2 last night, and it should be a good one! Nice Drshock ep2 on the way, I like hereing that. I just finished ep1 and it is amazing. Ty from a horror fan for keeping the podcast alive. @Bouser: Thanks for stopping by, and we appreciate the kind words regarding the Horror Jungle Podcast. It truly is our pleasure to keep it alive, and in turn, we want to thank you for your support of the show. It means an awful lot to us. Take care, and stay tuned for ep. #2 in 4 days time! @Sjaak: Thanks so much stopping by, and for letting us know what you think of the podcast. We're very pleased you enjoyed it! And the good news is Episode #2 has been recorded, and goes "live" 3 days from now! Thanks again for the kind words, and for listening to Horror Jungle. Nice review man. I really have been wanting to see that because I was really impressed by Bad Lieutenant. Adam: Thanks for stopping by, and for taking the time to comment.